April 08, 2018 at 8:55 pm. 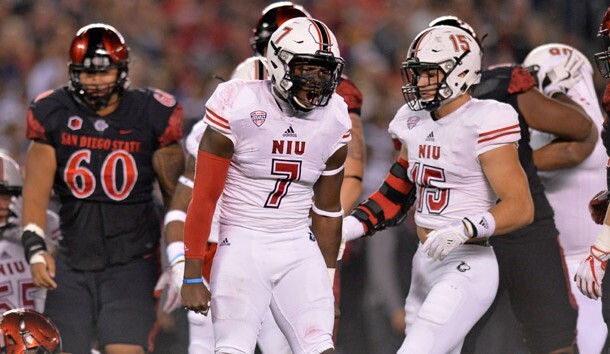 Linebacker Jawuan Johnson announced he is transferring from Northern Illinois to TCU on Sunday night. Johnson made the announcement on his twitter page after visiting TCU during the weekend. He told ESPN.com that TCU was his first choice due to the proximity for his family, who resides in Texarkana, Texas, which is approximately 210 miles northeast of Fort Worth. Johnson will be a graduate transfer for the Horned Frogs. The 5-foot-11, 217-pounder is set to graduate Northern Illinois in May. Last season, Johnson was a third-team All-MAC selection with 98 tackles and five interceptions, including a 25-yard interception for a touchdown in a 21-17 win over Nebraska on Sept. 16. Eighteen of Johnson’s tackles were for loss and he tied for the MAC lead with five forced fumbles. According to Pro Football Focus, he was rated as the highest-graded linebacker in the FBS last season. Johnson will join a 4-2-5 scheme that is based on speed and could replace Travin Howard, who led the Horned Frogs with 108 tackles.